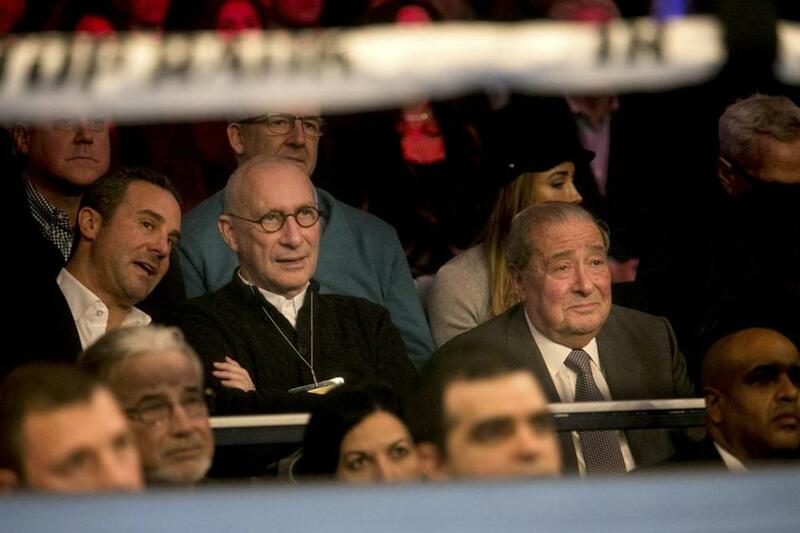 ESPN President John Skipper, in glasses, sat between Todd duBoef (left) and Bob Arum (right) of Top Rank as they watch the fight between Guillermo Rigondeaux and Vasyl Lomachenko at the Theater at Madison Square Garden in New York. In a year of high-profile departures at ESPN, Monday brought the most unexpected. John Skipper, the sports network’s president since 2012, abruptly announced his resignation, citing a problem with substance abuse. “I have struggled for many years with a substance addiction,’’ he said in a statement provided by ESPN’s public relations department. “I have decided that the most important thing I can do right now is to take care of my problem. I have disclosed that decision to the company, and we mutually agreed that it was appropriate that I resign. George Bodenheimer, ESPN’s president from 1998 to 2011, will step in as the acting chairman of the company for the next 90 days to help Disney chairman and chief executive officer Bob Iger find Skipper’s replacement. Disney is ESPN’s parent company. Skipper, 61, joined ESPN in 1997 as senior vice president and general manager of ESPN The Magazine. He was named president on Jan. 1, 2012, succeeding Bodenheimer, who had held the role since November 1998. Bodenheimer, now 59, became the company’s executive chairman when Skipper took over, a role he held through 2014. In Skipper’s early days as president, ESPN was still growing as it branched out into different forms of media. But in recent years, the network has hemorrhaged subscribers as cable television cord-cutters have found other ways to consume television programming. The network also locked into costly rights deals with professional sports leagues, including a $1.9 billion per year deal with the NFL, leading to a change in financial fortunes. That manifested itself this year with two significant layoffs on Skipper’s watch. The first in April eliminated 100 jobs, including several high-profile personalities. The second, in November, trimmed ESPN’s workforce of approximately 8,000 employees by another 150. Skipper occasionally found controversy recently, including a deal with Barstool Sports that fell apart in October after just one episode of its Barstool Van Talk program aired. That same month, host Jemele Hill was suspended for comments on Twitter suggesting Cowboys owner Jerry Jones’s advertising sponsors should be boycotted. Also, the working environment for women at ESPN, including claims of harassment, was the subject of a lengthy Boston Globe story last week. Through it all, Skipper remained a respected boss, a corporate figure who was accessible and friendly to the employees. After the news was announced, several current and former ESPN employees took to Twitter to share anecdotes and offer well-wishes to Skipper, including Hill. Skipper had recently agreed to terms on a three-year extension.